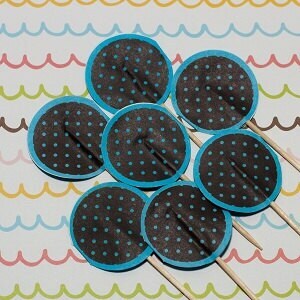 Dressing up your cupcake cake with these cute dark brown/blue polka dots fun pix! I do not take returns or exchanges on this item for safety and health reasons. Please make sure you like the item(s) you've selected before checking out. Thank you for viewing my shop. You do NOT need a Paypal account to pay by credit card! Choose the Paypal option during checkout. After you submit your order, click the "pay now" button. Scroll down and you will see the option to pay with credit or debit card without having to sign up for a Paypal account. orders that are not paid for (with no contact) within 5 days will be canceled. If you would like to upgrade to other shipping method, please contact me before you purchase. Thanks. CakeWithLove will not responsible for any lost packages. If you prefer other shipping method, please feel free to contact me. Excess postage will be refunded after order has been shipped. It may takes up to a week. All baking cups, cupcake liners, cupcake topper/picks, paper straws and dessert cups are NO returns or exchanges for safety and health reasons. Please make sure you like the item(s) you've selected before checking out. Items may eligible for returns are gift bags, boxes, twist ties and stickers. Please contact me before returning any item(s). Keep in mind that Items must be returned in the original packaging and in the original condition. You will be responsible for any costs associated with shipping the items back to us and you will be refunded for the purchase price of the items provided items are in fact in original packaging and condition upon inspection.